As we stood looking out over an extensive and lush garden, with the Taj Mahal in the background, my husband and I began to appreciate the size of this monument. A single large building with a distinctive dome, shining white marbles walls, set on a large marble platform, framed by four corner towers - it was more than the eye could take in. We had seen it from the balcony of our deluxe room at the Taj Mahal Hotel – and that was an amazing site in itself – the sunrise accented the white marble and gave the building a rose colored glow that was incredibly spiritual. Having seen that, we thought we were ready for seeing it close up, but now that we were here, no, we agreed we weren't prepared. It was just stunning. This monument to the love of Shah Jahan for his third wife Mumtaz was simply breathtaking - no wonder it was the prime destination for tours to India. As we walked closer, the building grew larger and larger until it dominated the sky. At the base, we left our shoes with an attendant for a small fee, and walked up about thirty feet of steps onto the base platform for the building – which of course, was enormous – like a huge patio surrounding the central dome. The exterior of the dome was covered with ornate calligraphy, stone inlays and carvings. When we walked inside the Taj Mahal, the cool shade under the high dome made everyone speak in whispers without being told. 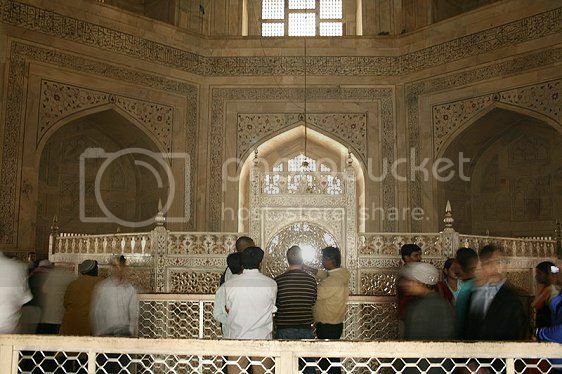 The guide pointed out the incredibly detailed and fine inlays all around the cenotaphs – the tombs of Mumtaz and Shah Jahan. I looked closely at scrollwork that was a series of tiny marble curlicues, incredibly intricate, that made up one whole wall, and began to appreciate why it took 20,000 workers 17 years to complete. It would take a long time for us to fully appreciate all we had seen on our visit to the Taj Mahal. When we visited the “Pink City” of Jaipur the sensory overload during our India tour only compounded. 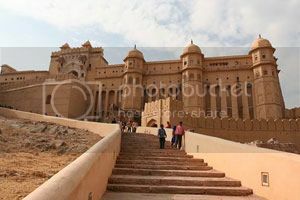 The Amber Fort (Amer Palace) was enormous – the mind boggled at the size of the complex of buildings, all made of red and white sandstone. Set on a rocky hilltop, a pretty good hike up a long and serpentine road, this fortress would have been a solid defensive position when it was built in 1592. We went from one ornate building, through a lovely courtyard and garden, to an impressive palace, with more to come, and I began to understand why our guide had characterized this as a fortress with many palaces inside it. We got to peek into the royal latrines – with walls of amazing marble carvings and inlays. Ah, the life of a Maharaja! The views from the hilltop were astonishing, and as our eyes followed the wall around the compound, it gave us a depth perception as to the sheer size of the complex. The only thing I could mentally compare it to in the States was the Hearst Castle – which I suspected would pale in comparison to the size and ornate architecture of this fortress. The next morning we had a deluxe breakfast at our luxury quarters in the Rambagh Palace in Jaipur, then took a peaceful stroll through immaculately landscaped gardens. 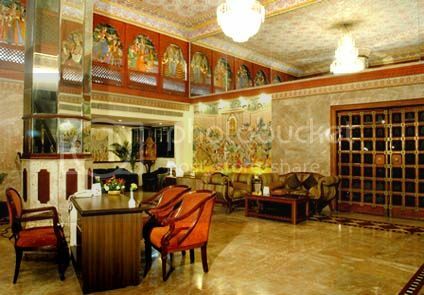 This former residence of the Maharaja of Jaipur had been converted to a palace hotel in 1957, and we certainly felt like royalty while staying there. Stunning and ornate architecture was everywhere we looked, and we explored the grounds with a newfound appreciation for the richness of the Maharajah lifestyle. That day we went by car to Dera Amer, a camp in the Aravali forest outside Jaipur, for our elephant ride in India. I thought we’d just get on the elephants, but it turned out we bonded first - by feeding bananas to our elephant. Then we boarded for our ride around the lovely and peaceful camp grounds. Halfway through our ride, we were greeted by a staff member who offered us beverages. We saw local farmers and herders, native huts, passed a medieval fortress, saw lots of colorful bird life, and had to stop a few times so our elephant could grab tree snacks. After the ride, we enjoyed drinks and dinner while a private dinner was prepared for us in an open air pavilion in the forest. For elephant rides, India is the place to go! There are so many astonishing sights to see on tours to India, along with unique adventures like the elephant safari, that I know I will return to experience it all again. 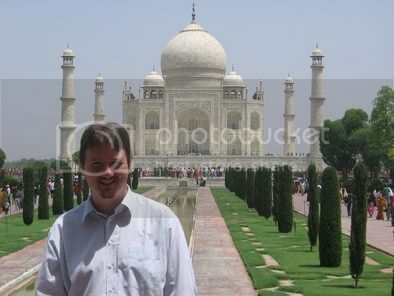 I want to revisit the Taj Mahal and Amber Fort. There was so much to absorb - I think it will take another trip to fully appreciate the majesty of India.